We have compiled some information about asset protection and income tax reduction. Feel free to read our Nevada asset protection book. Nevada is not the only state offering asset protection. 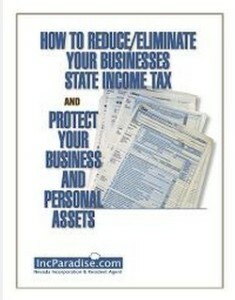 Are you planning to set up a Nevada corporation and want to learn more about asset protection and reducing your taxes? Did you know that Nevada doesn’t have any corporate or personal state taxes and if you move your business to Nevada you might achieve significant savings? We are not lawyers. We just put together information about asset protection and reducing state taxes. We are happy to do filing in all 50 States for your incorporation needs, but don’t expect us to give legal advice in complicated matters about specific legal situations, possible multistate structures, trusts, etc.